Water recycling systems are enjoying an expanding market at present due to the savings they can offer in the present climate of water privatisation, stricter effluent discharge consents, and rising effluent charges. Also the drought of 1989 brought many vehicle wash operators to a standstill due to the water authorities ban on the use of water for the washing of vehicles. Accent has been placed on a more compact design with lower running costs and lower capital costs, to make water recycling even more cost effective to the customer. Please note failure to use the correct wash chemicals will detriment the plants ability to remove impurities and consequently the vehicle wash will start to leave vehicles streaked after washing. When washing a vehicle the water is supplied to the jet wash via a booster pump fed from the water storage tank, a level sensor within the internal carbon tank is activated when water is supplied to the pressure washer which starts the sump pump and draws water from the below ground sump tank and passed over a wedge wire screen which will remove the polypropylene balls and deposit them into the blue bin next to the unit, the water is then forced through two 20' in-line cartridge filters before being spread over the surface of the activated carbon filter bed. The water is gravity fed through the carbon (hence the low flow) and through the internal strainer into the wash water storage tank below. The water is then ready for re-use. The sump pump in turn activates a dosing pump which does Aluminium Sulphate directly into the inlet of the below ground interceptor/sump pump. The Aluminium Sulphate helps to form large blocks of dirt which will settle out in the interceptor. Being an acidic chemical the aluminium sulphate also acts as a neutralising agent. Automatic backwashing is achieving with the use of a small air blower which introduces air at a set time into the bottom of the filter bed and lifts the carbon to stop it from blocking during use. The interceptor should be at least the ST 3250 however although a higher initial cost would be incurred, a larger interceptor would save on future chemical consumption. The treatment plant consists of a single storage tank mounted on a common base plate. Complete with internal activated carbon filter tank, dosing pump, sump pump, booster pump and air blower. All pumps and controls are water proof to I.P.55. Skid Mounted Tank Fabricated in grade 304 stainless steel. 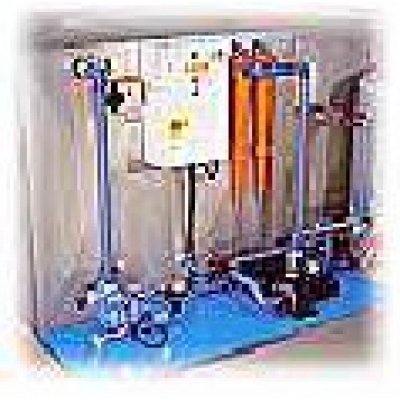 Activated Carbon Filter - Gravity Fed Activated carbon filters are designed to remove residual detergent, emulsions, chlorine and organic molecules from the water. Activated carbon is able to remove these impurities due to reactions which take place at the water/carbon interface. Activated carbon has been treated to vastly increase its surface area, the resultant substance has a surface area of hundreds of square metres per gram. The carbon will eventually be saturated by contaminants and will require replacing. Pipework All connecting pipework and fittings are PVC class E solvent wedded in accordance with procedures stated by the manufacturer. Electrical Equipment The panel contains a single starter for the sump pump and a control circuit linked to float switches and level controllers in the tanks. The panel controls include an automatic backwash system and lamps for sump pump running and tripped, power on and filter backwash. The plant is designed to operate fully automatically once installed. The plant will automatically deliver clean water to the jet wash. The plant is switched off using the door interlocked isolator on the control panel door or at the customers mains isolator. Plant should not be turned off at night, due to heaters (where fitted) and backwash which require a 24 hour supply. The backwash time clock needs to be set to run for 30 minutes during the night, a solenoid and valve have been installed on the outlet of the wash pump to enable the system to drain of if this is required due to excessively dirty vehicles (this will only be active when the air composer is running) the flow can be adjusted using the valve. The operator can adjust the frequency of the backwash time clock if he wishes the plant to backwash at a different time or for a different duration. If the plant stops of its own accord and the sump pump overload trip light comes on, the unit can be reset by pressing the black start button on the motor starter contained inside the control. If water is lost off the wash pad then an automatic mains water top up solenoid valve will open to replenish the system (this is controlled by a float switch fitted below the Activated Carbon Filter). If the system the mains water top up valve will operate and enable the user to continue washing. The excess water will flow to drain via the interceptor / sump pump tank overflow. Connect the mains water pipe to the mains water solenoid valve. Connect 2' or 1.5' suction line from sump pump to access chamber. Connect 1' drain line to access chamber. Place the oil absorbent sheets in the sump pump (1st chamber). Run the 1/4 hose between the Supa Jet and the sump to enable the chemical dosing. Connect the demand level float switch in the collection/interceptor tank to the position indicated on the terminal rail of the control panel. Adjust the height of the above float switch so that it switches off before the water level reaches the top of the mesh box, so that the response time is at an optimum. The power supply to the control panel from their own mains isolator 13A 1 phase. The water supply to be terminated on the front centre of the unit at the solenoid valve. Fill the wash water tank and sump tank with clean water. Prime the sump pump and the suction line by filling the water. This is done by opening the black self prime gate valve adjacent to the sump pump, thus filling the pump suction line with water. When the pump re-primes, close the valve. If fault persists, clean the sump pump non-return valve in the sump before re-priming. Start the jet wash and the unit working by switching the power on to them. On extremely busy or dirty sites the drain solenoid will need to be connected to a suitable drain (using 1/4 reinforced hose). The client is required to perform the following routine maintenance procedures to ensure the continued trouble free operation of the equipment. Ensure only vehicle wash water is draining into the interceptor/collection tank, problems will be created if excess fuel spillages enter the system, or if floor cleaners are flushed into the collection/interceptor tank. Check oil absorbent sheets (if fitted) if they are saturated with oil, clean and re-use, or replace as necessary. The sheets can be re-used up to 30 times if they are cleaned of oil properly.